2 years in the making and the patience is evident. Combining pop meoldies with old school soul/motown touches & folk/americana lyrics comes a fresh warm sound that will put a smile on your face, a thought in your heart and a memorable hook on your lips! Although only 23, Amanda Zelina has already experienced death and rebirth. That notion is at the core of her full-length debut album, Love Me Till I’m Me Again, the culmination of a three-year journey that found the singer/guitarist chasing her musical ambitions to Los Angeles before returning home to Toronto, consumed by a battle with her demons. Her art proved to be her savior. Reaching back to the primary sources of classic songwriting: blues, country, folk and soul, Zelina infuses this mix with raw emotions, and a haunting voice that stands apart from the current influx of female artists. In fact, it can be said that her closest musical contemporaries are male, as she draws heavily from the same well of brutal honesty as Ray LaMontagne and Ryan Adams. Similarly, Zelina’s strength is that her music crosses all boundaries. Her only intention is to penetrate the hearts of all who listen. Born and raised in the town of King City north of Toronto, Zelina’s first musical connection came through listening to blues and soul tapes her father played on road trips. She says she first started developing song ideas during this time, but didn’t act upon it until graduating high school and taking up the guitar. Her next move was to L.A., ostensibly to study music more seriously, although she admits her primary motivation was to pursue what ultimately became a doomed relationship. What followed was a rapid descent into clinical depression and a diagnosis of Bi-polar disorder. Once able to pick up the guitar and sit at the piano again, the new songs rushed out in a torrent until a unifying vision for the album, both musically and lyrically, became apparent. 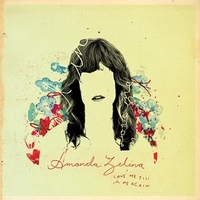 Zelina began recording Love Me Till I’m Me Again on her own, but when she approached City And Colour producer Dan Achen for mixing help on two tracks, he immediately offered to do the entire record at his Catherine North Studio in Hamilton.